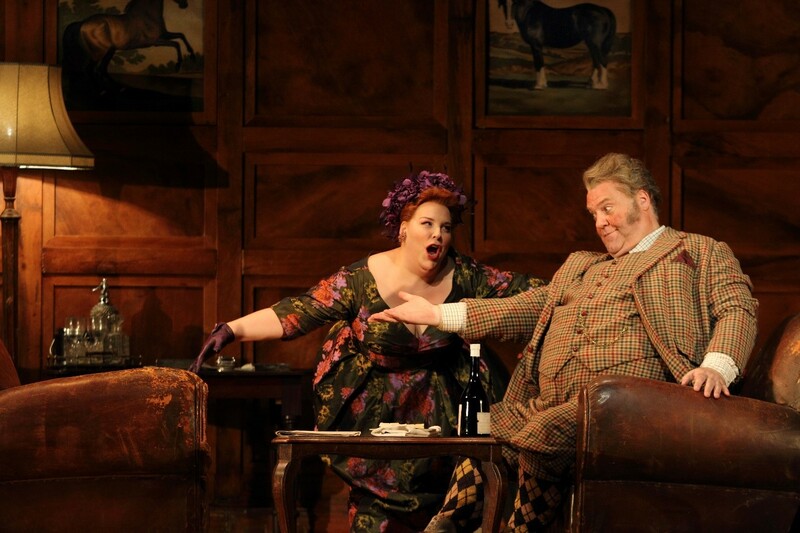 It’s no secret that Robert Carsen’s production of Falstaff (seen July 13), which premiered at London’s Royal Opera House in 2012, has become an absolute must for zealots of Verdi’s ultimate opera, not to mention for unconditional Carsen fans. After some highly successful globetrotting over six years including New York, Toronto, Milan and Amsterdam, the production returned to Covent Garden for a final run this July, with three of Canada’s most outstanding singers joining the cast: Michael Colvin as Falstaff’s flunky Bardolfo; Frédéric Antoun as the love-struck Fenton and Marie-Nicole Lemieux as the high-jinks Mistress Quickly. Windsor’s other Merry Wives included Puerto Rican soprano Anna María Martínez as Alice Ford, Scottish mezzo-soprano Marie McLaughlin as Meg Page and Austrian coloratura Anna Prohaska as Nannetta. Carsen has updated the setting from the time of Henry IV to England in the 1950s, ingeniously imagined by designer Paul Steinberg. 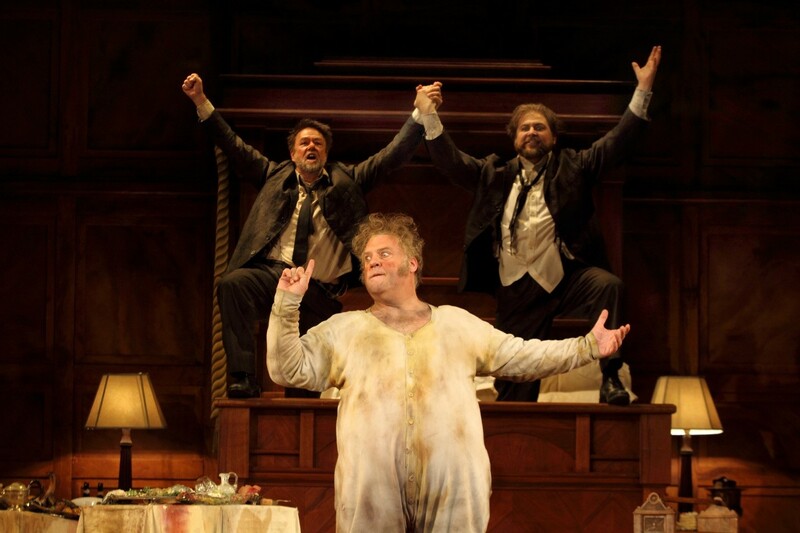 From the moment the curtain goes up to reveal Welsh bass-baritone Bryn Terfel’s Falstaff lounging in a seigniorial bed in the once-posh Gartner Inn, to the final tutti, “All the world’s a jest,” there is no hint of routine in Canadian director Daniel Dooner’s staging of this revival. Falstaff’s oak panelled bedroom is full of trolley serving carts covered in wine-stained linen tablecloths, silver platters and dirty plates that attest to the Fat Knight’s notorious appetite. When his henchman Bardolfo and Pistol (the excellent American bass Craig Colclough) mock his obesity, he defends his girth by slapping his belly and singing: “This is my kingdom! And I’m going to enlarge it!” Terfel’s sustained high F here is thrilling as is his singing throughout; in that most Shakespearean of arias, “L’onore,” Terfel is at his best. In the second scene, we find the Merry Wives lunching in the dining room of the Garter Inn. Their chic 1950s outfits are just a taste of the vast panoply of satins, flowered prints, handbags, pumps, hats and wonderfully imaginative costumes that the designer Brigitte Reiffenstuel has in store for us. The wasp-waisted corsets and flared skirts are particularly suitable to the elegant Anna María Martínez who is an impeccable Alice Ford. Antoun and Prohaska form an impetuously lovable couple and win us over with their effortless voices and style. In this staging, Fenton is a waiter working at the inn’s dining room. Smartly dressed in tux and white gloves, his ploys are touching as he tries to woo his sweetheart away from the group of chattering matrons. Lemieux is in her element here, the voice is stunning, and she is extravagantly funny especially in the opening scene of Act II, when Mistress Quickly visits Falstaff. As Ford, Simon Keenlyside is delightfully comical until his soliloquy where he believes he has been cuckolded and begins to brood with beautiful dark intensity. In the final scene, Fenton’s “Dal labbro il canto estasiato vola” is magnificently sung by Antoun and the whole atmosphere is enchanting thanks to the lighting of Peter van Praet. Prohaska’s “Sul fil d’un soffio etesio” adds a heavenly note. Then, as often in Carsen productions, something none of us was expecting: a thoroughbred horse! There it is at the opening of Act III, with its magnificent head poking out of a stall munching on a sack of hay. If no “philosophers so thoroughly comprehend us as dogs and horses,” this equine friend seems to listen indifferently to the pitifully humiliated Falstaff throughout his monologue. Nicola Luisotti conducts the Orchestra of the Royal Opera House with warmth and humour making this midsummer Falstaff truly a dream. Previous articleOpera Canada Awards—’The Rubies’: Announcing our 2018 Honourees!